The PSYCHe Issue: Our First Print Edition is Here! If like me you grew up in Nigeria, or any African country for that matter, mental illness likely conjures images of naked “mad” women and men roaming the streets after having brought calamity upon themselves by some wrongful act or other (a storyline Nollywood certainly hasn’t shied away from). By and large these cases are the cats that got out of the bag — the ones we get to see. But equally serious are the insidious ones, the ones that many of us experience but manage to hide in order to avoid shame and ridicule. We, and African women in particular, are dying under the weight of anxiety, depression, chronic fatigue, adrenal fatigue and other mental illnesses. Perhaps it is fueled by the pressures of modern-day life, of technology, of social media, of taking over our fathers’ jobs while retaining our mothers’ responsibilities. Suddenly the lines we’ve repeated so often — that Africans don’t have depression, that we are the happiest people on earth, that it is not our portion — are starting to ring hollow. 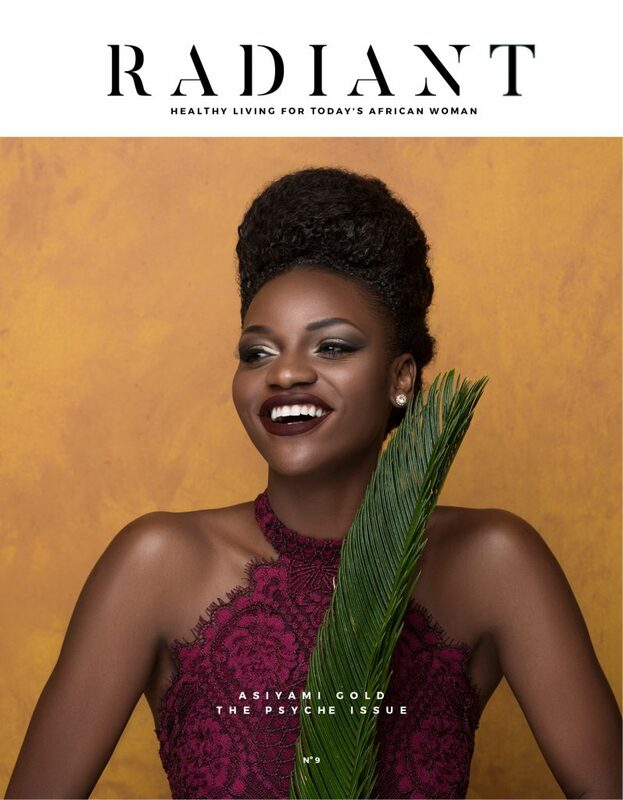 In this issue of Radiant Health, the PSYCHE issue, we explore mental health and the African woman from different angles, including a personal essay by Adebola Rayo on living in Nigeria with borderline personality disorder and bipolar, as well as a compelling LOL feature on the science of laughter as the best medicine. There is power in knowing that we are not alone. Often it is through hearing others’ stories that we can begin to find our own path to healing. I applaud those who have shared their stories for our collective healing by bravely coming forward about issues that our communities have condemned as taboo, shameful and not for public discourse. On that note, I’m thrilled to have another brave woman, Asiyami Gold Wekulom, grace the cover our first-ever print issue. Asiyami shares deeply and with raw honesty her own struggles, which took her through the depths of depression and suicidal thoughts, to her emergence as the poised, beautiful, creative sensation and the woman of many talents whom we can’t seem to get enough of. I know you will draw strength from her story. And there’s even more to this issue than meets the eye. From straight talk about six-pack abs, to meeting this issue’s local champ uziza and heart-warming recipes, to our thoughtfully curated mindful gift guide and exploring what ethical fashion means to you, this issue is overflowing with so much to delight you. In our featured interviews with extraordinary African women, we talk culture with Maame Adjei of An African City and Girl Going Places, fashion with Eseoghene Odieta of Hesey Designs (even Richard Branson wore her shoe! ), mouthwatering, beautifully plated dishes with Chef Fafa of Ndudu by Fafa, a glowing skin regimen with Aminah Sagoe of Emmaus, and more! Since our beginning two years ago, we’ve gone from web issues (issues 1-5) to digital editions (issues 6-8) on the Apple and Google Play newsstands. Now, with issue 9, I’m pleased to introduce yet another way for you to enjoy Radiant Health with our very first print issue — and with a new look to boot! I’m so proud of how far we’ve come, all thanks to you. It’s been an incredible labor of love bringing this print edition of Radiant Health to life, and I hope the care and love my team and I have put into creating it is evident as you enjoy your copy. As always, I would very much love to hear from you. Your feedback means the world to us and helps us create issues that are the most meaningful to you. You can always reach me by email (address below). I read every single message. I wish you and your loved ones the very best in 2017! Next Article: Can A Business School Competition Save Nigerian Newborns?